I never knew anyone who actually built a Cold War bomb shelter, though I do recall the very useful hide-under-your-desk drills in grade school. It didn’t occur to me at the time that I was one of millions of Americans living in harm’s way with respect to our open-air atomic tests and their fallout. Apparently that idea did occur to the monied interests of the Las Vegas entertainment industry. Neighbors to the Nevada test grounds, casino and hotel operators worried that firing off atomic weapons just down the road could be bad for business. If ever there were a time for a public relations campaign, this was it. So they invented the Atomic Cocktail. 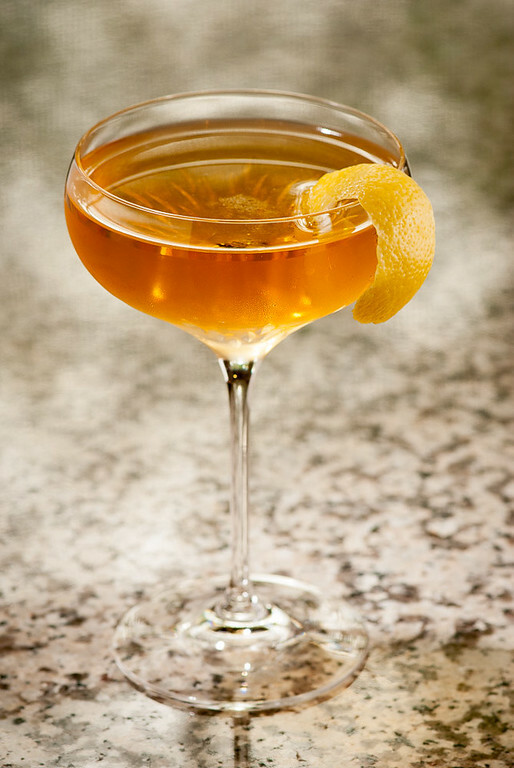 The Atomic is an effervescent, easy-drinking blend of Cognac, vodka and Champagne. The idea, I guess, was to suggest a light-hearted “What, me worry?” attitude toward the pervasive fear of the times. Of course, the Atomic Cocktail can’t be credited with single-handedly saving Las Vegas—it takes more than the desire for a new cocktail to trump existential dread—but it does offer a sense of mid-century ethos, a sort of whistling-past-the-graveyard bravado. It also offers a model for a grown-up vodka cocktail. Despite its vodka content, the Atomic is not afraid to taste like a drink that uses flavorful spirits. 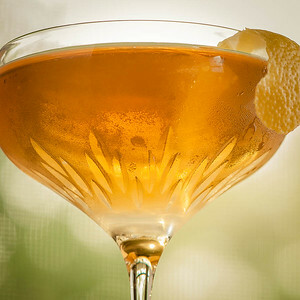 It is an assertive, fruit-based drink—Cognac, Champagne and sherry—and it uses the vodka as a way to open up the flavors of the Cognac, much the way that a little water opens up a good whiskey. Stir the first three ingredients with ice until cold. Strain into a well-chilled cocktail stem and top with champagne. Optionally garnish with a lemon twist. It seems we owe David Wondrich the credit for rediscovering the Atomic; the recipe here is much as he presents it in his 2005 Killer Cocktails . A note on the Champagne: I tried this drink with a handful of sparkling wines, and it seems that the more full-bodied, the better. Prosecco, for example, is too light, and too acidic to blend well with the dominant Cognac. The same with the widely available Korbel Champagne. You definitely want a Champagne with a fairly full flavor to stand up to the brandy. For my tastes, slightly yeasty Champagnes, along the lines of Heidsieck Monopole and Chandon, were the most successful. I’ve tried to figure out if the unknown barman who developed the original recipe had some sort of political message in mind as he developed something destined to be “the Atomic Cocktail.” Does the vodka have meaning here? I’d like to think so. The rest of the drink, all French and Spanish—nah. And yet, the choices seem unusual for the ’50s, sort of a throwback to earlier times. I find it peculiar, and fascinating. “Under my desk with the Atomic Cocktail” at cold-glass.com : All text and photos Copyright © 2012 Douglas M. Ford. All rights reserved. An interesting find — don’t believe I’ve ever seen this one before. The unusual vodka-cognac base is something else! I’ll have to give it a try (perhaps once I get my hands on something beefier than Korbel). The Atomic reminds me of another drink, the Communist: not truly mid-century (1933), and a bit heavy on the juice (especially orange), but it can run along the same lines, thematically. First found in Vintage Spirits & Forgotten Cocktails. Beautiful photos, as always, Doug. Just duck (shoop!) and co-ver! It crossed my mind that it would be amusing to do up the Communist for May Day, but you’re right—best to wait until sometime when I’m more in the mood for fruit juice. It sounds sort of brunchy, perhaps? I think I first learned of it in Vintage Spirits , too. Glad you enjoyed the pix, thanks. I like everything about the Atomic: the name, ingredients, the Vegas association, and the zeitgeist it represents. Another great find, Doug. Thank you. Plus, how can you turn your shoulder to a drink that is described as effervescent? Well done. BTW, I hope you collect all of your posts into a book one of these days. I would be the first to buy a copy.